We all make mistakes, but not everyone owns up to them. It's unfortunate that this incident happened. 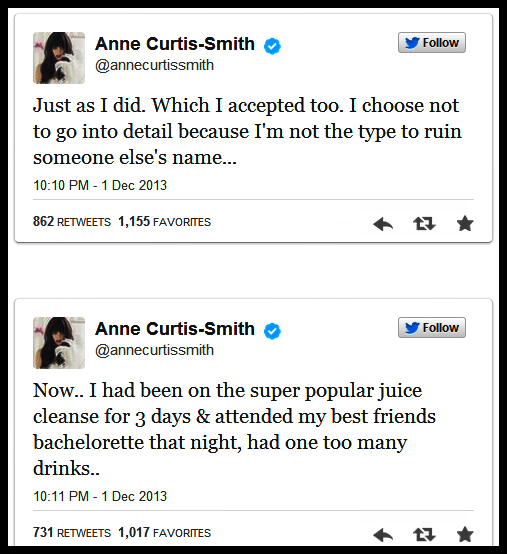 But the most important thing is Anne Curtis owned up to her mistakes and apologized to the people involved. Whether you admit it or not, it takes a lot of courage to own up to one's mistakes and apologize for one's actions. We all make mistakes but not everyone owns up to them. Accepting responsibility for what she did is commendable. It takes a big person to admit that they made a mistake and to say "I'm sorry." I am proud to be an Anne Curtis fan. Good for you, Anne. Doing the honorable thing will always pay forward with reciprocity of honor. "Hey, everyone. I will be making my official statement now and after this, I will not be giving any interviews about this issue anymore. I choose to do this right away because I’ve always been an open book and I don’t like to hide anything…"
When I was told of my behavior AND the person who started all of this, due to this person’s inappropriate behavior, apologized to me too…"
"Just as I did. Which I accepted, too. I choose not to go into details because I’m not the type to ruin someone else’s name. Now…I had been on the super popular juice cleanse for three days and attended in my bachelorette that night, had one too many drinks…"
"Which led to some of these unfortunate events. That’s why they say, “Drink in moderation.” I will charge it to experience and a lesson learned. I’m sorry if I let any fans down…As you all see, I’m just like any other person that makes mistakes in life…"
"Thank you to everyone that has messaged me about their support. With where I am today I owe all of you my honesty. Good night." Anne did not identify who it was who committed “inappropriate behavior.” John Lloyd Cruz, who was allegedly also drunk like Anne, was allegedly playfully flirting with Anne that night” until that incident near the comfort room. But since the parties involved have apologized to each other already, let’s hope that the whole thing would be put to rest. After all, all’s well that ends well. I'm impressed. It takes great moral fortitude, humility and courage to so graciously take responsibility for your actions and their consequences. I truly respect how you've handled this situation, Anne. Just don't do it again. Blessings to you & yours! #honor #respect #bigperson #respect begets respect. Picture Source: Google. Credits to the owner.